The Mummy takes place in the early 1900's when an archaeologist named Lawrence Stratford discovers the tomb of of Ramses II. On the tomb walls, on scrolls and everywhere is written the curse of the mummy. He is Ramses the Damned. Immortal. To bring him out of this dark chamber is to reawaken him from his coma-like sleep. The murder of Lawrence Stratford takes place quickly after opening this chamber, and all his finds, including the mummy, are then sent to his daughter, Julie Stratford, to exhibit in her home before sending them to the museum. 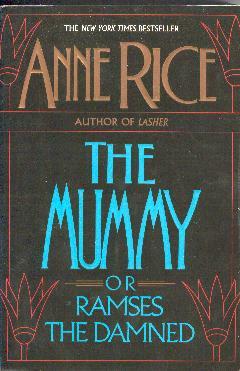 The mummy awakens in opulent Edwardian London, in the Stratford house, and after winning the trust of Julie, becomes Dr. Ramsey, an old friend of Julie's father, from Egypt. He learns of the new times and experiences w/ Julie, but soon returns to Egypt to see what ruins are left from his time. What he sees the remains of, however, is a past Egyptian Queen. His greatest love. His greatest heartbreak.... and the possibility to bring her back to life.